In the early 1980s, theologian, John Hull, lost his sight. He knew that if he didn’t try to understand his blindness it would destroy him. In 1983, Hull started an audio diary. Over three years, Hull recorded over 16 hours of material - creating a story of loss, rebirth and transformation. In their first feature film, writer/directors Peter Middleton and James Spinney have taken these original recordings and combined them with interviews with John and his wife Marilyn. Actors lip-synch to the voices of the family alongside stunning cinematography (by Gerry Floyd) and wonderful sound design. Notes On Blindness is a remarkable and deeply moving documentary. John Hull’s soft Australian voice is mesmerising as he describes his experience with blindness. Hull spent the first two years after losing his sight finding ways to carry on with his life. There were, of course, many practical issues to overcome. For example, how could he continue teaching? How could he read? Told that blind people don’t read “big books”, Hull organised a group of people to record books onto audio tapes for him. However, once this work was done, reality set in and Hull realised that he had to face and understand his blindness. Notes On Blindness offers truly fascinating insights into just what it means to lose your vision. For example, Hull describes dreaming in pictures and how odd it feels to smile when you can no longer see someone smiling back. Middleton and Spinney use stunning visuals to explore the nightmare that Hull experiences. He feels claustrophobic, trapped, lost and scared. The documentary feels almost like a horror film at times. Indeed, one scene clearly references Stanley Kubrick’s The Shining. It is so moving to hear Hull talk about his blindness. Tears sprang to my eyes when he asks just who has the right to deprive him of the sight of his wife and children on Christmas Day? I felt his pain, his distress. The cinematography in Notes On Blindness plays an important and effective role. Images form a beautiful accompaniment to Hull’s spoken words. Meanwhile, the lip synching technique is really effective - particularly by Dan Renton Skinner as Hull. While I never quite forgot that I was watching an actor, I felt that his performance captured Hull’s spirit. I was left feeling inspired and uplifted by this beautiful film - it is a wonderful tribute to John Hull’s remarkable journey. Peter Middleton and James Spinney first adapted John’s diary material into a series of award winning short films. The first of these, ‘Rainfall’, won the Best Short Documentary Award at Hot Docs 2013. This was followed in 2014 by the Emmy Award-winning short, also entitled ‘Notes on Blindness’, which screened at Sundance Film Festival and won Best Documentary at Encounters Short Film and Animation Festival. Alongside the premiere of the feature film, Sundance 2016 saw the unveiling of Notes On Blindness: Into Darkness, an immersive virtual reality (VR) project based on John’s sensory and psychological experience of blindness. The interactive experience complements the story world of the feature film and forms an integral part of our outreach programme. Each scene addresses a memory, a moment and a specific location from John’s audio diary, using binaural audio and real time 3D animations to create a fully immersive experience in a ‘world beyond sight’. 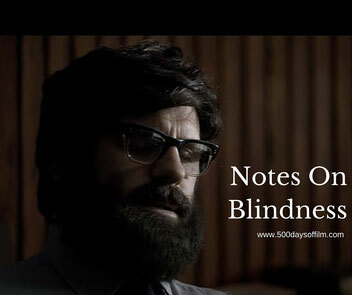 Have you seen Notes On Blindness? If you have, what did you think of this documentary? I would love to know - you can leave me a comment in the box below.